Well, the big day is fast approaching and my kids are buzzing with excitement. 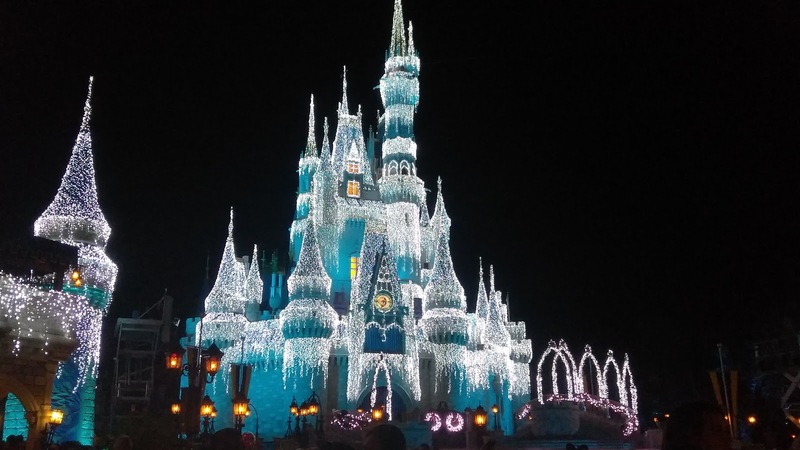 We went into the parks this past weekend, to squeeze in some holiday fun, (and to get in the last visit of 2017, since our passes are now blocked out). We will still be on property plenty over holiday vacation, visiting Disney Springs, the resorts, etc, so I'll get my Disney fix, but no park access makes me sad! The good news is, when my passes start working again, Festival of the Arts will be getting geared up over at Epcot, so I'll have that to look forward to! Today I want to share with you a magical, wonderful, true-life Disney story, perfect for the holiday season. This is not my typical post, but this season calls for something unusual and special. It's easy to get cynical this time of year, with all of the commercialism and whatnot, so it's important to take those moments to appreciate true holiday magic when we can find it. I hesitated at the idea of sharing this story, because of how deeply personal it is, and the fact that it involves my daughter, but I thought I could bring to you a ray of light. A glimmer of good. Hope for magic. Four years ago, The Hubs and I were unfathomably fortunate to have been chosen by two amazing kiddos to be their parents. We adopted our kids from foster care in 2013 and our lives have been pretty magical ever since, but not always easy, by any stretch of the imagination. When your kids have lived through horrible trauma very early in their lives, even the moments that seem like they should be the most happy, have a tarnish of pain to them. Holidays especially. Last year, we went to Epcot to see Santa. The REAL Santa. We have seen him every year for the past three. At 8 years old, I wasn't sure how much my daughter still believed, but she wanted to see him, so I was happy to take her. After my son, K, and my daughter, D, sat with Santa and Mrs. Claus, D had this awful, worried look on her face. I asked her what was wrong and she heart-breakingly divulged to me that she thought Santa knew how bad she was. Well, I held her and cried for about an hour, right in the middle of Epcot, reassuring her over and over that she is good, she is kind, she is wonderful and that even on her worst day, she has NEVER been a "bad" girl. I know she doesn't believe me. She was mentally abused into not believing me. Someday she might, but not now. I assured her that Santa isn't watching her every move and waiting for her to mess up. He sees that her heart is kind and that is all that matters. Bad people are hateful, hurtful and don't wish well upon others. That is NOT who she is. She eventually (falsely) agreed that she's not bad. But that wasn't good enough for me. I decided I'd dream big. I went to Santa's line greeter and quickly spouted, "I'm probably going to cry and I apologize, but my daughter just saw Santa. She previously lived in an abusive household before we adopted her, and right now she's very upset because she thinks that Santa thinks she's bad. Is there ANY chance that we could-" She interrupted me, asking where she was and insisting that I get her now, for a private audience with Santa. I went over and told D that Santa wanted to see her, and she collapsed in a ball of relief/excitement/fear/joy. I told her she didn't have to, but she shouted that she wanted to. I explained to her that Santa's friend stopped me and said that Santa knew something was wrong when D went to see him the first time, and he wanted to talk to her again. The poor greeter. We stood there, both D and I, sobbing, waiting to see Santa again. There were only 3 families left in the line and then Santa was done for the night. When it was our turn, the Photopass Cast Member said, "Hey, you were here before!" I stepped in and said, "Yes, but we are back for a very special reason. Is it ok if I talk to Santa?" I thanked Santa for "inviting us back" and explained to him that D was worried that he thought she hadn't been good, but that she is wonderful and kind and generous. Santa enveloped her in his arms and said, "You are a special girl. You're at the top of my Nice List. You are very, very good, and I know that." 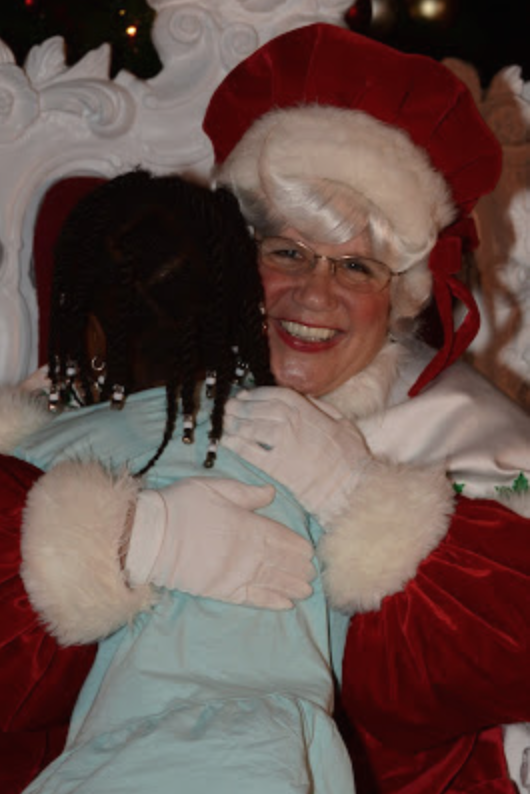 Mrs. Claus looked at me with tears in her eyes and hugged D, telling her how wonderful she is, and how loved she is. They made her feel so special. Well, everyone within ear shot was in tears, myself included. When D came down from their seats, every Cast Member asked her for a hug and told her how great she is. They even hugged me and thanked me for caring so much. When they walked by, Mrs. Claus grabbed my arm and said, "Thank you". I shook my head and said, "Thank YOU. So much. You don't know what this means." It didn't solve everything. But for a moment, maybe even more, D believed. She believed in Santa. She believed in her own goodness. And she believed in Magic. I couldn't ask her a better Christmas wish come true. May your holidays be filled with magic and wonder, and may your 2018 be filled with special and magical moments all year through! Until next time, Disney Fans, have a magical holiday season!